At this ‘me of the year it’s especially hard to avoid overeating. But let’s be honest, stuffing yourself rotten isn’t limited to just Christmas. Sometimes that family box of Quality Streets becomes a single serving with gut-busting consequences. It’s happened to the best of us. But the real problem is usually what happens afterwards – in our body and in our mind. Are you filled with regret, miserably mulling over starting a juice fast? Or do you feel the urge to go for broke and top it all off with a big bowl of Ben & Jerry’s? And, physically, do you fall into a food coma and feel like your food has turned to concrete in your tummy and suffer from hours of discomfort? Firstly, don’t panic. Sometimes reframing the situation and having an action plan is all you need to rebound as soon as possible . It can be easy, post-binge, to beat yourself up. Things like “no self-control,“ “lazy,” and “fat” can get thrown around. Maybe you end up overdoing it at the gym or swear off eating for the rest of the day. It’s super easy to treat your body badly after a pig out, but here’s where taking a step outside yourself is critical. Dairy Milk wrappers, halfway into an all-out chocolate binge. Caught red-handed, this kid looks up at you, terrified, ashamed, awaiting punishment. What do you do? Do you insult the child? March him or her over to the treadmill to run off every last calorie? Of course not. With that in mind, let any name calling and punishment stop. Treat yourself with the same compassion you would treat this child. Situations like this can lead to further self-destructive or self-punishing behaviour if you don’t try to counter the negative feelings. Trying to view yourself from a distance or as another person, like a child, helps engage a sensible reaction where you can regroup and bounce back. Back-in-the-game action plan. OK, you’ve got your head on straight and forgiven this entirely human moment of overdoing it. After water and walking, and letting a few hours lapse, your tummy feels like it’s returned to its normal size. 1. Plan your next healthy meal. It’s easy to rebound from a binge by banning food. But don’t let the pendulum swing to the other extreme. Ground yourself with a healthy meal that fits in with your healthy lifestyle. Keep in mind, skipping meals can trigger another road trip to Ben & Jerry’s. Even if you’re not hungry, simply planning your next meal can remind you that food is not your enemy. 2. Plan your next workout. You don’t want to go for a jog right after a binge but scheduling your next workout is also a reminder that after overeating, you’re getting back to your normal fitness routine. It’s also a great affirmation of how you see yourself: You are not defined by this binge. 3. Get some perspective. The world is bigger than a bag of M&M’s, or several bags of M&M’s. And this moment of indulgence is but a blip on the radar of life. Tune in to larger issues: Read a newspaper, a book, or put on some music. There are bigger things to occupy your mind than this moment. 4. Call a friend. Sometimes food benders come from a place of loneliness or discomfort. If you’ve realised your spree was triggered by these feelings, don’t ignore them just because “the damage is done.” Reach out to family, friends and hug it out. 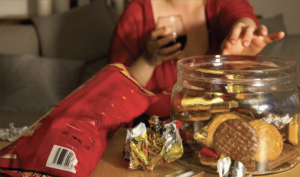 If you spot a reoccurring pattern with overeating, professional help from a therapist or counsellor can be helpful. Admit that overdoing it on food is the human condition. We all have our moments. Remember, you are not defined by your mistakes, but your reaction. Getting back on that healthy-eating horse is as easy as practicing a little self-care.